During one of our usual stops to True West Campground, they were experiencing an exceptionally busy season. Muddy Pond area Mennonite stores also proved to be very busy with shoppers. 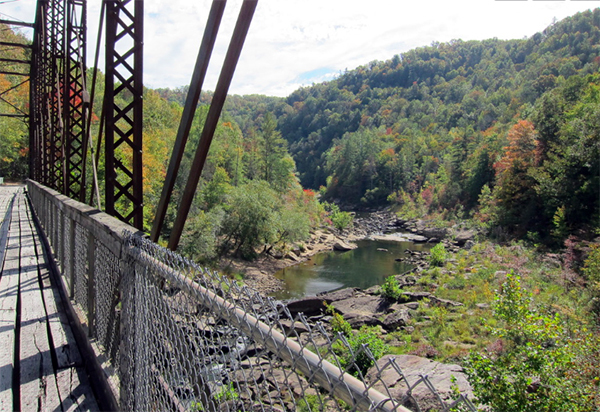 It seems there is a resurgence of interest in the Big South Fork Recreation area, which is beneficial for all. A recent horse breed organization report indicated a decrease in horse show attendance, and an increased shift in equestrians pursuing trail riding. Our first day of trail riding took us to Wild Cat Den. 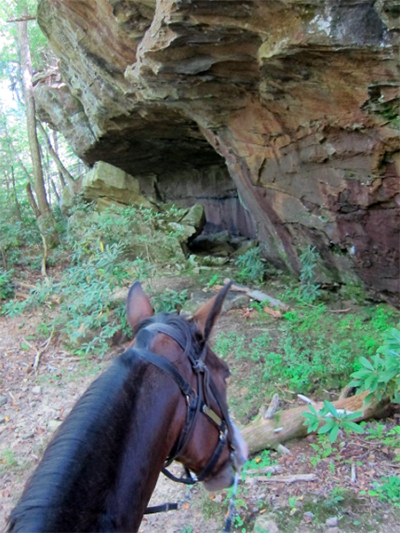 On day two, we rode to Hippy Cave. 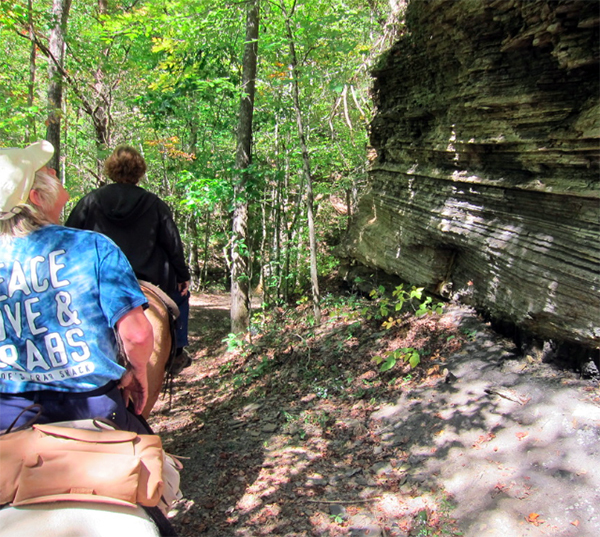 We are consistently impressed by the endless scenic sandstone bluff formations. They never cease to amaze the onlooker on the trails. Alongside the trail to Blue Heron Mine during the third day, we encountered several abandoned mine shaft entrances which were barricaded. 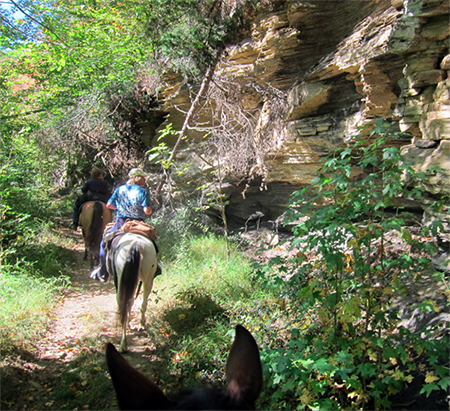 Check out these views along the trail from horseback! At the Blue Heron Mine, there was a corralled horse tying area so that riders can eat lunch under the park's picnic pavilions, use restroom facilities, or visit the historic displays located here. At this area, you can visit the building where coal was prepared for transport. This historical interpretive area is also accessible by tourists via automobile. 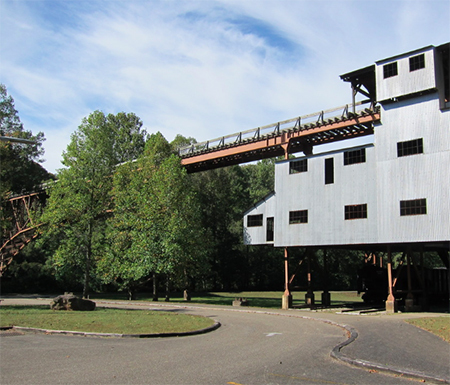 This is a great area for both railroad and history buffs on past coal mining. Under the coal preparation building, rail cars parked to be loaded and transported by rail. Southern Railway Company hauled the processed coal from the Blue Heron (Mine#18), then owned by the Stearns Company. The Blue Heron mine was the Stearns Company's last coal mine to be established, which in turn had the latest electrical and mechanical improvisions of that time. One man on average loaded 12 to 15 tons of coal per day at 60 cents per ton for labor pay. In 1962, the mine was closed due to a fire, as well as the mine running out of coal. A favorite night out to eat while in Onieda, TN is Prestons Steakhouse. Outside the entrance to the Steakhouse is a frontier themed covered wagon. 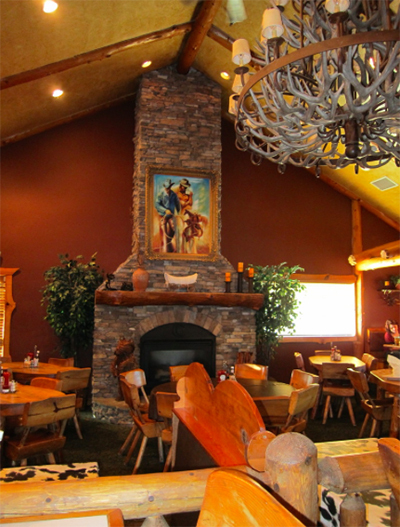 The atmosphere and decor inside Prestons Steakhouse carries a pleasant western theme. 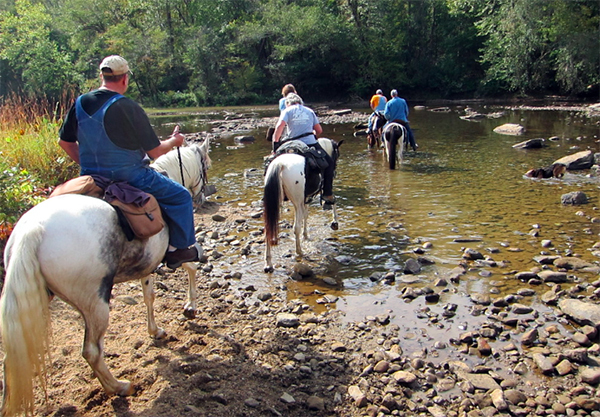 Our trail riding adventures through Big South Fork also contained several crossings of the Big South Fork and Cumberland River. Fortunately for us, the water level in the river was very low due to the current dry, warm spell experienced during our stay there. River crossings can prove to be unsafe during early spring wet season or unusual summer rains, so check trail conditions before heading out. Every day never ceased to impress us with unusual sandstone formations. On one section of the John Muir trail is an old train trestle bridge that you can cross on horseback. The view of the river and gorge area is spectacular from the bridge. 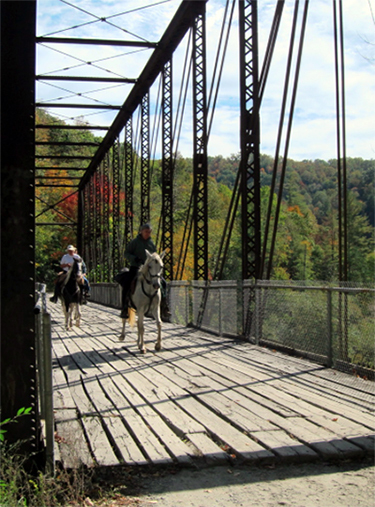 At the end of the bridge you will find a place to tie your horses if you prefer to cross the bridge by foot to view the scenery. 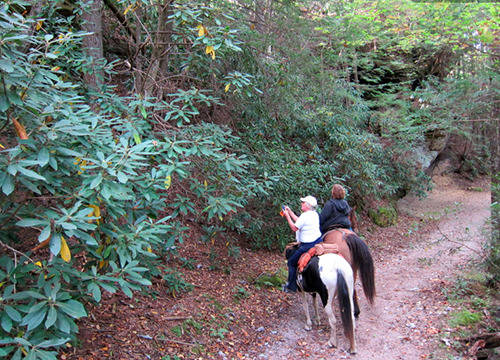 Big South Fork Recreation Area is a must-see and do for avid trail riders as it is a wonderful and scenic place to ride. The trails are also well marked and maintained. 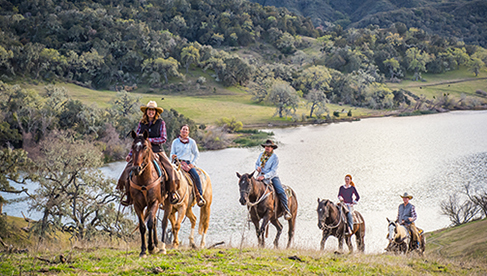 Several members of our equestrian group make this an annual trail riding trip. 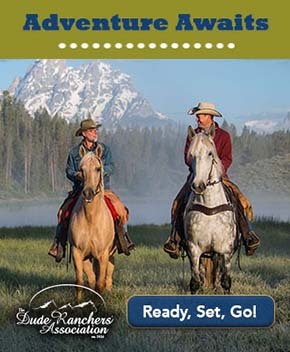 So load up and make this stop as one of your trail riding destinations! 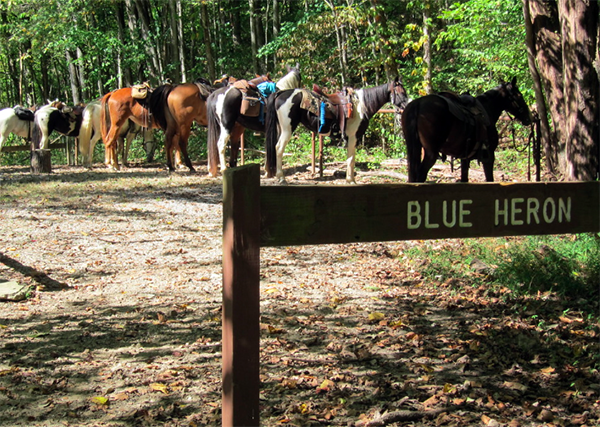 Read Susan's other article about riding at Big South Fork, part of the Equitrekking 50 State Trail Riding Project.